Professional remodelers know how to incorporate style, form and function to improve a family’s day-to-day lifestyle. This was certainly the case for Mark Mackmiller, CR, owner of mackmiller design+build in Eden Prairie, Minn., who recently remodeled a split-level home for a mother who adopted three special needs children under the age of nine. Eight-year-old Billy, who has cerebral palsy, is a quadriplegic and needs assistance with daily washing and dressing. A larger, more functional bathroom and bedroom area would ease daily grooming tasks and still work for the rest of the family. and extra floor space is allotted so that wheelchairs have more space to turn. 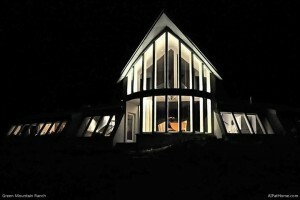 This project was designed with short and long-term goals. The new lower level of the house features a new bath and bedroom for Billy, along with the kitchen and family room. His mom’s long-term plan is to move out of the house when Billy is an adult with an onsite caregiver living upstairs. Billy would share the kitchen and dining room with the caretaker. In the bath, a new curbless shower eases access to the wash space. Installing a hand-held shower with a 10-foot hose, in addition to the normal shower head attached to the wall, lets the caregivers to direct the flow of water where needed. 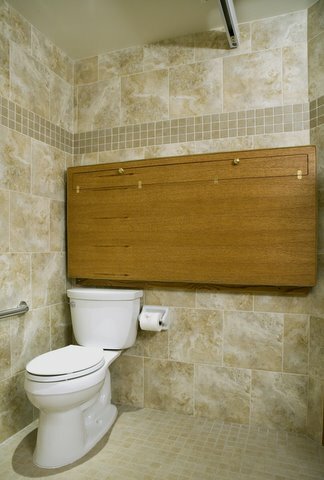 Grab bars in the shower and a new comfort height toilet provide safety for the family’s grandfather, who visits often. 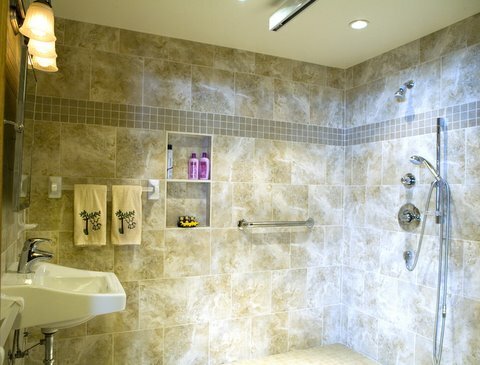 An ADA-approved sink, lever faucet handles and a tilt mirror are useful for the entire family. One of the room’s special features is a 28 x 59-inch retractable changing table that drops down from the wall so that Billy’s mom and caregivers can more easily change him in the bathroom. A portable hoist on a ceiling track helps move Billy to and from his shower chair, changing table and wheelchair. The table feature is very cool, I was a little confused at first looking at just the picture until I read the explanation. Nice remodeling job, and challenge met!